It has been a minute, so I think it is high time for a good Before and After blog post! This project was AMAZING to work on, because the clients are friends of mine from college! They had recently purchased a charming, beautiful home in Fort Worth, and they needed some help with a furniture plan for the formal living room. Take a look at this living space before. 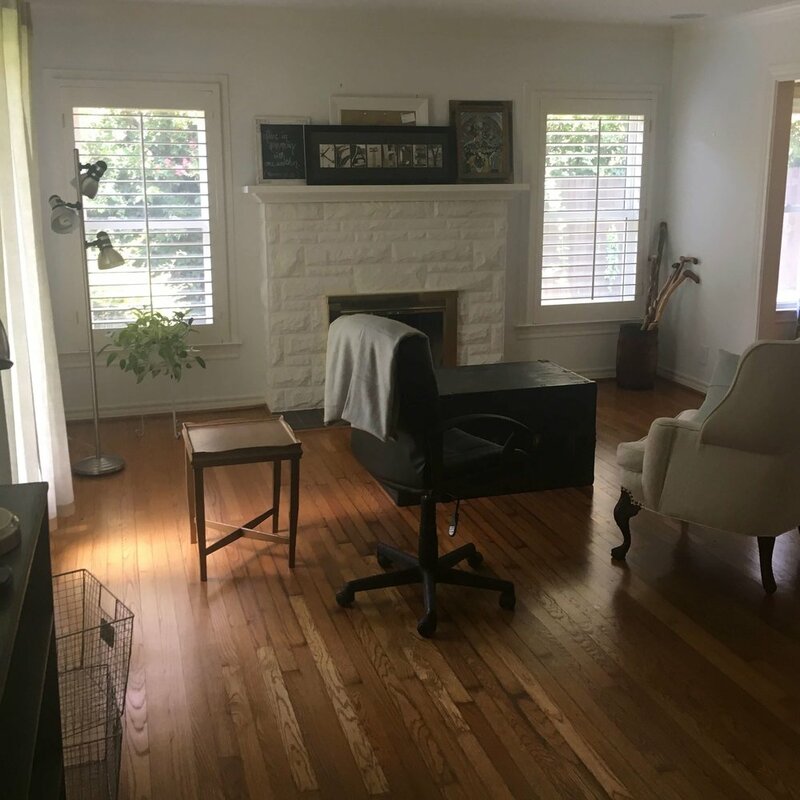 The room was a blank slate, because they did not have a formal living room in their previous home, so there was no existing furniture that we had to work with. The room presented a few challenges - it is a long and somewhat narrow room, so the furniture layout would have to be carefully considered. Also, the front door puts you right into the room, with no space that was set aside for the “entry,” so I wanted to create a more welcoming feel. The clients and I both were fans of the white walls and the stone fireplace, so we knew those elements were going to stay. As I started the design process, it was important to determine a functional and welcoming layout. As you can see in the floor plan, we decided to separate the room into 2 zones - an “entry” area right in front of the front door, and then a seating zone around the fireplace. A helpful way to create zones in a single room is through area rugs - I planned to use 2 distinct rugs to ground each space and make the separation clear. For the style of the furnishings, my clients wanted a look that was modern, clean, and streamlined. A gorgeous caramel leather sofa, with midcentury modern styling was the perfect scale for facing the fireplace. Two small scale arm chairs with light gray upholstery worked great to contrast against the bright white walls. A beautiful moroccan inspired rug with fuschia, gold, blues, and grays gives the design so much color and pattern. 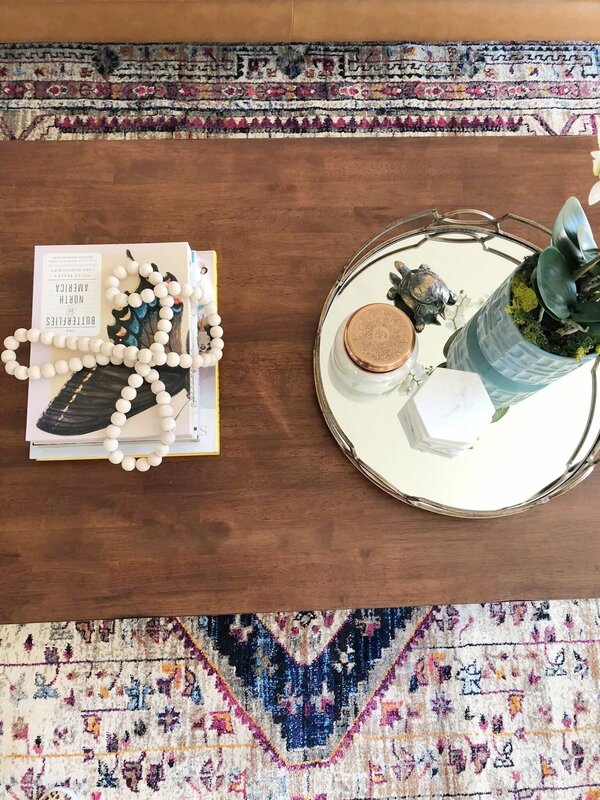 We actually were able to use a great dark wood coffee table that my clients already had. And finally we wanted to add dramatic drapery panels on the front window that faces the street, using a super cool abstract brushstroke gray/white fabric and matte gold drapery hardware. On the “entry” side of the room, I planned for a beautiful natural fiber rug that would wear well with foot traffic. The main furniture piece to anchor the space is a round rustic pedestal style table, to be centered in the entry zone. A gorgeous glass/gold light fixture will be centered above to bring the eye up. For extra seating that can be pulled into the living room, I sourced two cool iron/leather stools that tuck under the entry table. We had a lot of blank wall space on this side of the room, so on one wall we planned for an eclectic gallery wall, where they could display family photos and artwork. On the opposite wall, a huge oversized arched mirror would reflect light back into the space, and help visually fill up the wall. You’ll have to forgive me, because these are all iPhone photos, but I can’t help but show the transformation! The room is super cozy and welcoming, and the 2 “zones” in 1 room look like they were always meant to be that way! The elements of modern, rustic, natural, and bohemian work so well together in this space, and I also love all of the personal touches to make this room feel like their true home. We are still going to have the chandelier installed over the entry table, and that will be the true finishing jewel! I would love to hear from you - what is your favorite element in the transformation?